The time is almost here! Dumbo is about to lift off in theaters on March 29th! 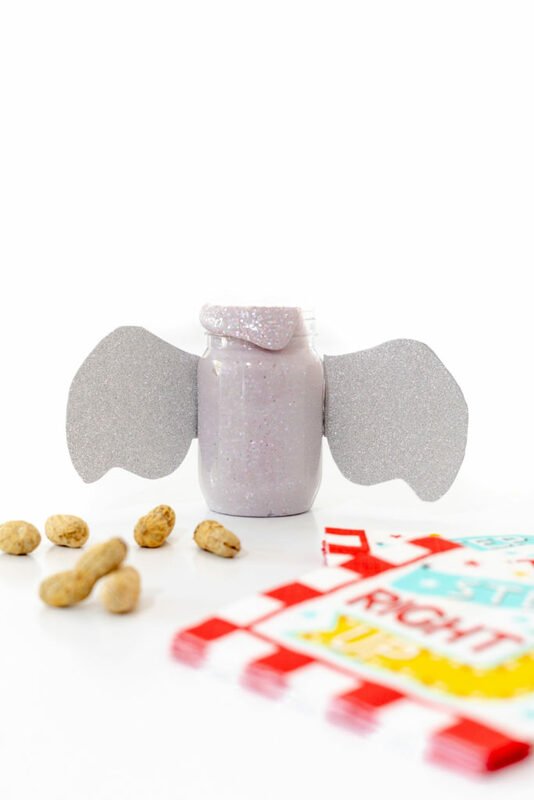 Recently, I shared party ideas to celebrate this much awaited flick and today, I’m sharing a fun Dumbo inspired craft that could even serve as a party favor. 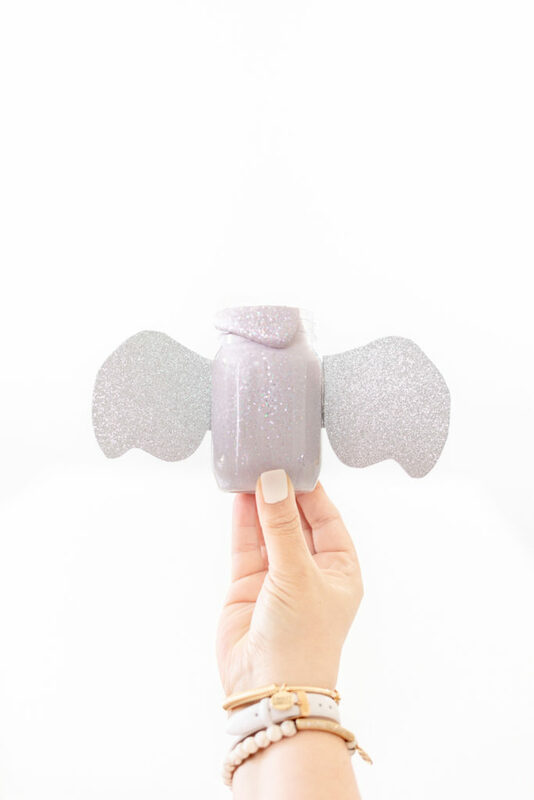 Enter slime jars filled with simple grey and glittery slime colored like our favorite little elephant. I’m super excited to see this movie! I feel like I’ve been waiting to see it forever. Everything about the trailer looks so on point. Have you seen it yet? You definitely don’t want to miss this one! Now let’s get our hands deep into some slime! This is literally my first time making it. Yes, seriously. I’ve been missing out! So many ways to make it, am I right? I followed this simple recipe for the base from Elmer’s Glue and added a nice splash of glitter and it’s perfect. First thing to mention is that recipes like this require adult supervision and this particular recipe is not recommended for the super little people 3 and under. Make sure to read their recipe page for more intel and recommendations before getting started. Also note that this slime recipe is not edible. 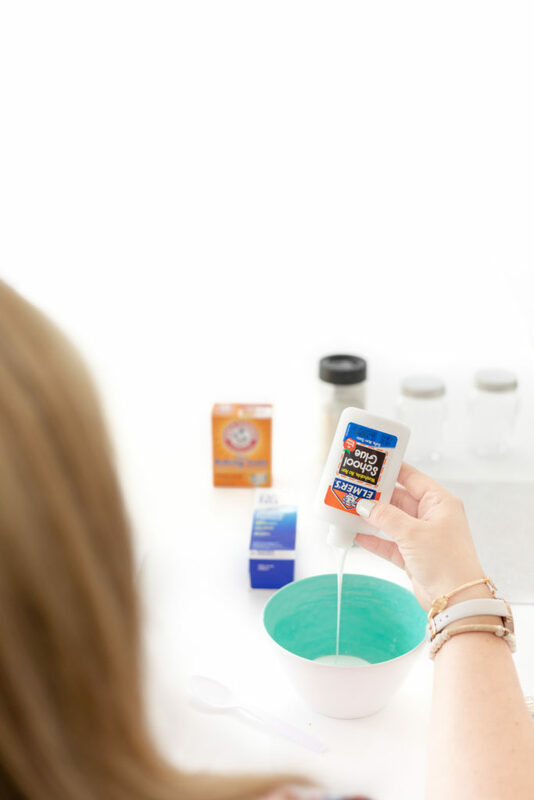 Step One: Pour out the entire bottle of glue into a bowl. Step Two: Add the baking soda and mix well before moving to the next step. Step Three: Carefully add one drop of black food coloring and mix well. Step Four: Add a good amount of glitter and mix well. Step Five: Add contact lens solution and mix until slime starts to form. Then, knead with your hands until everything is perfectly combined and feels nice and slimy. 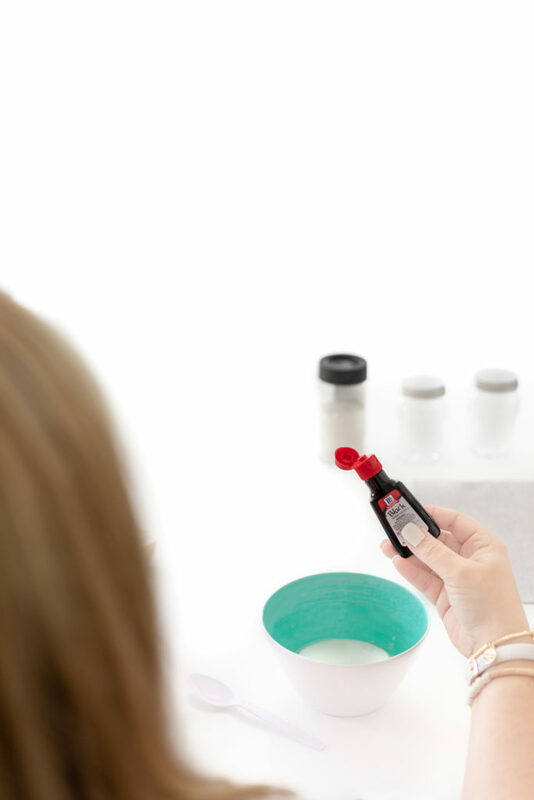 If you find your slime too sticky, it’s recommended to try adding a few more drops of the solution and mixing it in. Voila! The fun Dumbo inspired slime is ready! Set it aside and let’s get to crafting the easy Dumbo ear jars. This super fun idea is inspired by these adorable Tinker Bell Glitter Jars that I fell in love recently over at Made to Be a Momma. If you’re a Tink fan, you will LOVE them, too! Here is what you need to make the jars complete below. You will also need a glue gun or another fast drying glue. You will cut out two Dumbo sized ears out of glitter sheets. I used a sticker sheet and then stuck them back to back to make it a little thicker. Use the size of your mini jar to help decide on which size to make your ears. I pulled up an image of the original Dumbo graphic to create the overall shape. One you’re happy with the shape of your Dumbo ears, it’s time to glue them into place. I used a glue gun and the jar was ready in just minute since the glue dries so fast. Yay. Now, add your slime to the jar to complete this fun little craft. I can’t help but to think these would be so cool to give out as a party favor for a Dumbo themed party. 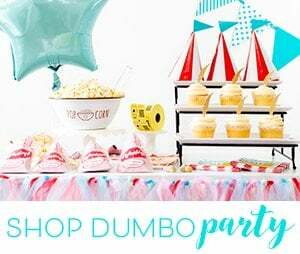 Get my Dumbo Party Ideas now. 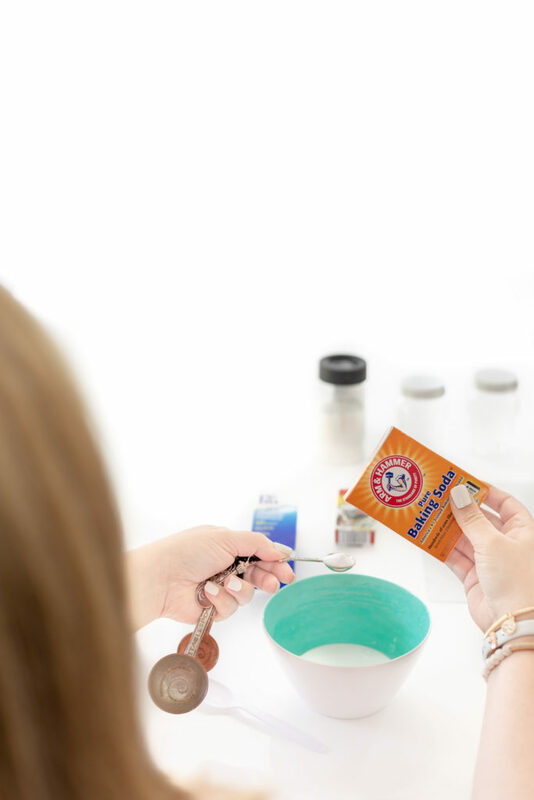 Side note: If you’re new to making slime like I am, one of the biggest questions people ask is what kind of contact solution works best for making slime? For this, I used renu fresh multi-purpose solution and it worked out perfectly. I found this video below to be super helpful in comparing various brands to see what works best. You might want to check it out if you have some on hand but aren’t sure it it will work. 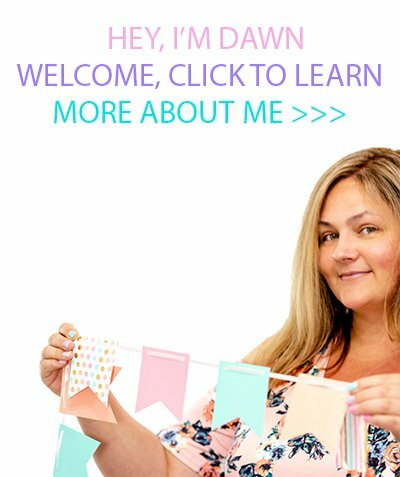 Love Disney crafts? I have some more special ideas to share at Cutefetti. Are you excited to see the Dumbo movie, too?